For those that recall my entry on NPC lesbians in Suikoden 2, you’ll probably know I am a huge fan of the first two Suikoden games. One of my all time favourite sections was the cooking mini-game in Suikoden 2, which I went out of my way to play as often as possible. I liked it so much I started me own dedicated cooking RPG in around 2000... But never finished it. Chef Island is unfinished. 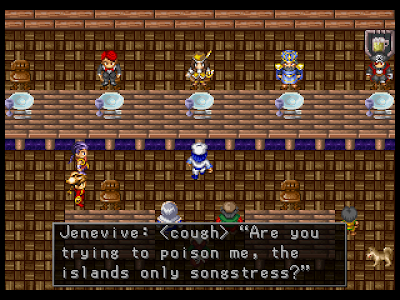 It was inspired by Suikoden 2 and Harvest Moon, but it’s sheer ambition killed it. Even though incomplete, I think I was really on to something. So before someone does an iPhone app and steals my idea, I’m going to document it here. 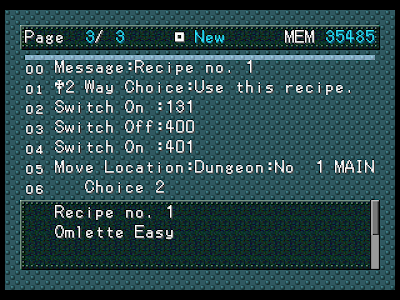 I have also included a save file for it, in case anyone wants to try it. I also WARN you, it contains a lot of high-school level humour plus, to my great shame, internet slang. 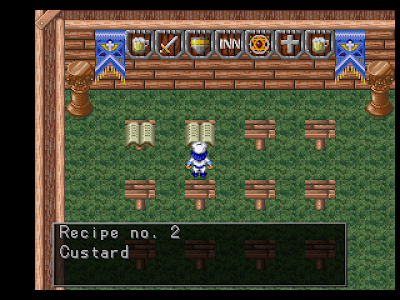 In Suikoden 2 you could acquire recipes throughout the game, along with specialised condiments such as soy sauce and spices. 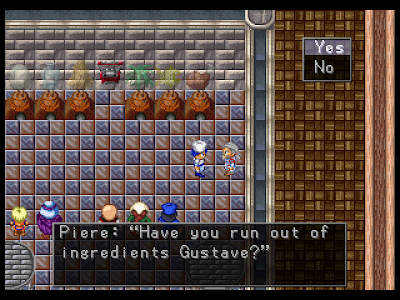 You’d then choose a recipe, along with a condiment and watch it being prepared. 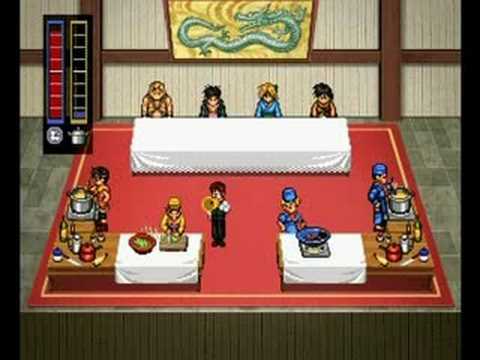 Then there were 4 judges taken from random characters you’d recruited, who’d vote on yours or the rival chef’s recipes. It was incredible. In Chef Island I tried to recreate this cook-off in the setting of a school for up-and-coming chefs. Days would pass and once a week there’d be a cook-off. In the time building up to this you’d be expected to acquire ingredients, discover recipes and prepare by learning about the judges’ preferences. In this way the game was a bit like Harvest Moon. I’d planned for 20 recipes (which was too many for the amount of work it needed! ), each requiring 3 ingredients derived from a pre-set number of 6: meat, fish, eggs, milk, vegetables and flour. I’d envisioned that ingredients could either be found or bought. Eggs could be taken from chickens, fish could be caught, and so on – but only a finite amount. Food would spoil from week to week and so more elaborate recipes would require some effort to acquire the needed amount of ingredients. 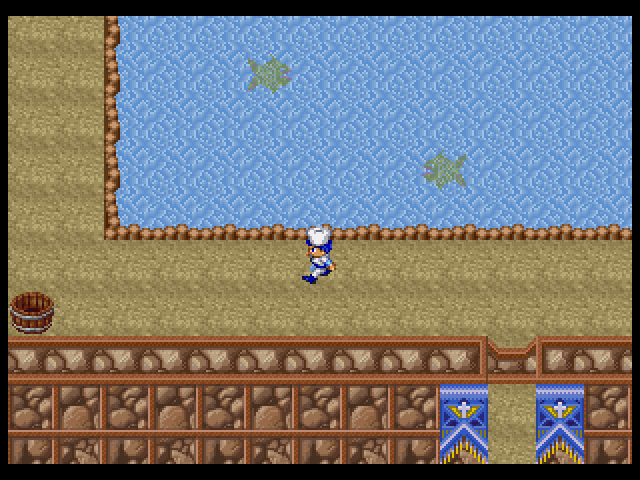 I even planned a fishing minigame where you had to chase an NPC fish in an underground pond to catch it. Meat had to be bought from the store, and vegetables could be grown (or at least they would have been, had I completed the farming section). The difficulty was trying to balance legitimate ingredients, and eventually I simplified them into food types (cheese dishes would use milk, instead of specifically cheese). Each ingredient was to have a trigger attached to it (IE: something like fish sets trigger 20 to ON, or whatever), and come cook-off time, you had to choose a recipe from the library and then walk up to a series of 6 pots, each representing a specific ingredient and add them from your inventory, whereupon the game would either recognise the three triggers and you’d get your dish, or it would say you failed your recipe. This took HOURS of work. I didn’t finish this, but I had a big chart drawn up on paper with hundreds of food combinations and related trigger numbers, as I tried to whittle it down. 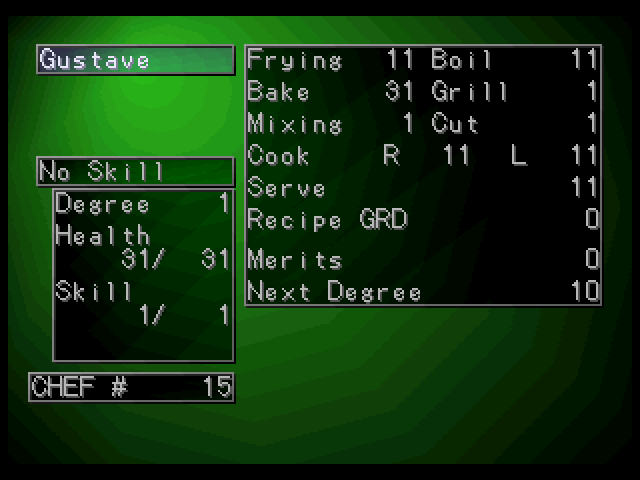 If you test the game, and set trigger 500 to ON, you can sort of see how everything would have worked, and can kind of play around with the cooking and serving sections. Pressing CIRCLE allows your character to walk through walls in test mode. Judging was an equally complex affair: 5 specific judges had specific tastes. The pirate had spent so long at sea he hated fish but loved meat dishes. If you had a meat trigger set to ON he’d give the thumbs up – but with 20 recipes to calculate, I had to write about 16 pages worth of trigger recognition. Another was a vegan I think, so a meat trigger gave a thumbs down. The 5th was purely 50/50 randomness. I never finished this bit (you can demo it a little using the save file), but in hindsight if anyone had thought about it, they could have found a perfect dish and aced it all the time – with a little work though this judging bit could have been great. 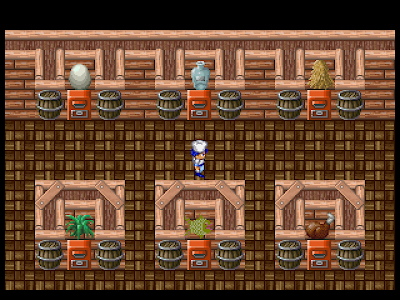 The game was intended to play out with a simple day cycle where you could perform tasks to help with the cook-off. I included inventory items such as ‘days’ which would increase with each night’s sleep, so the game could keep track of the passing of time. 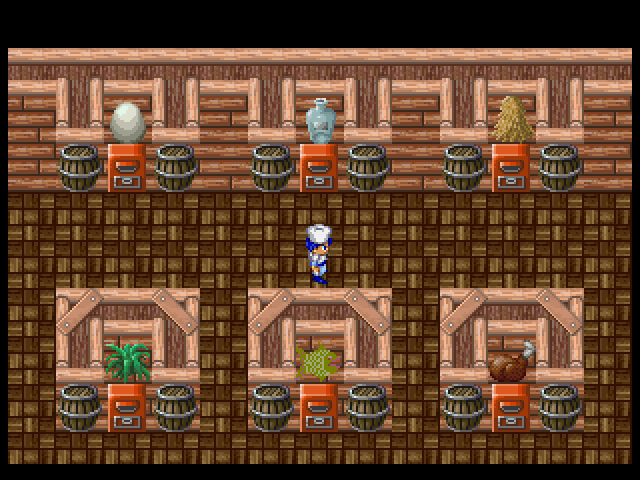 If you’ve used RPG Maker on the PS1, you should agree it’s a clever workaround. 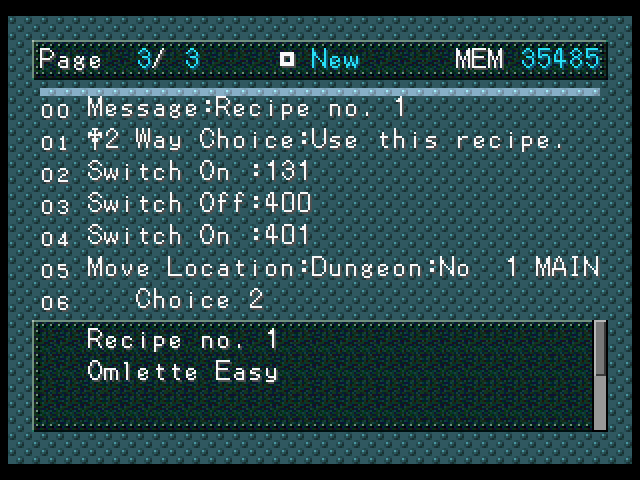 Completing side-quests granted you either ingredients, gold or special recipes to add to your library (if you check, there’s an incomplete library section). 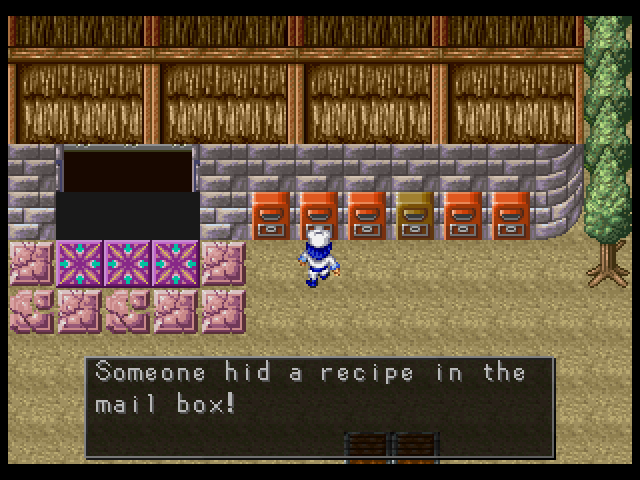 Sometimes recipes were just hidden in random places, like the laundry, a letter box, under someone’s duvet in the dormitory. You got one gold coin every day, which were supposed to be gifts from your mom who kept posting you stuff. I also intended for there to be regular letters from mom when you won cook-offs and went up in rank. There’s post boxes, but no letters in them yet. 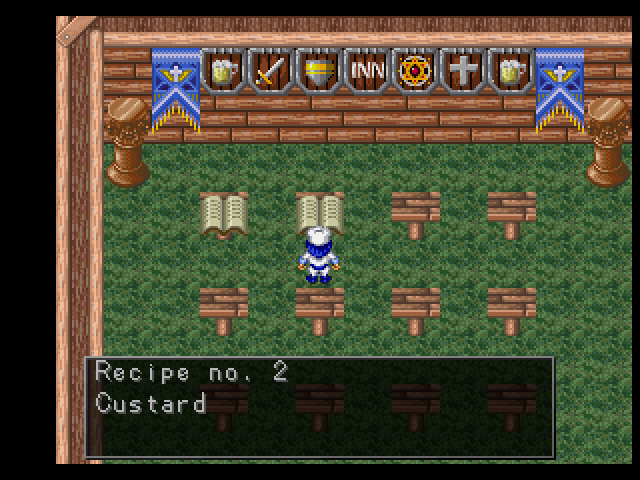 There was also a lengthy fetch quest where you collected an item, traded it with someone for something else, and continued trading the item until you got a special recipe (I added the items but never implemented the quest itself). After I’d finished the main cook-off section I had wanted to fill it with little details, secrets passages, hidden goodies, and other things. Plus mini-games. You were also to have a rival, Tim Crapdson, who would win by default in case 3 judges or more gave you the thumbs down. 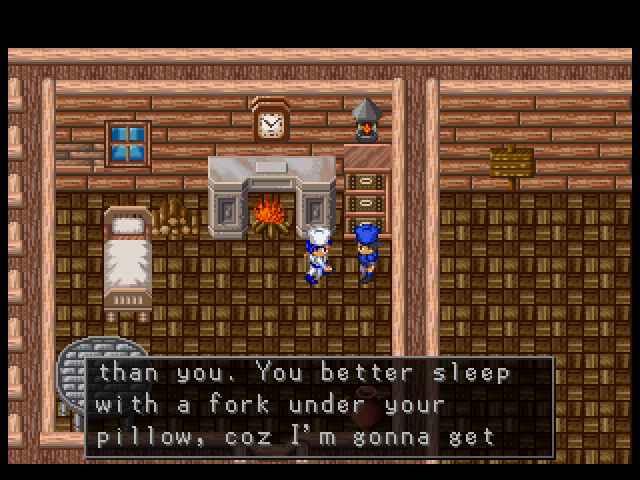 He’s hugely annoying, but there is some funny dialogue from him regarding sleeping with a fork under your pillow. 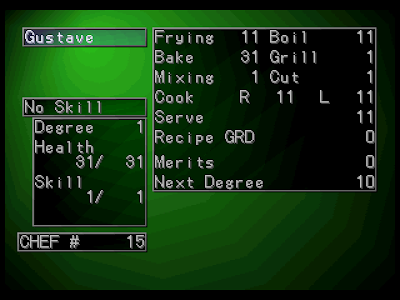 Plus, the main character’s skills weren’t stuff like attack or magic evade, but skills like fry, boil, and so on. I had intended to somehow use these later down the line. Viewing what’s here already shows that there was a spark of something which, if finished, could have been incredible. As it stands it’s about 30% done and not really playable. More annoyingly, the one game which I did finish, Morishinden Chojin, no longer exists due to a faulty memory card. 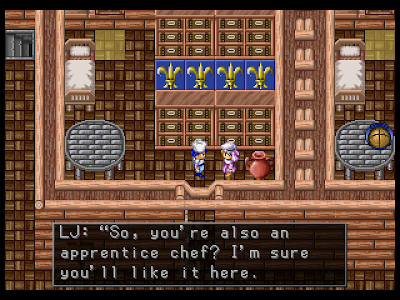 I’ve often thought about revisiting Chef Island, since I sincerely think it would be an awesome game in the vein of Harvest Moon and could probably make me money. 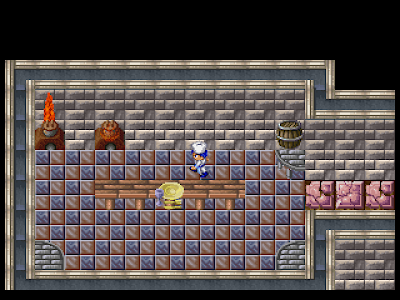 I’ve thought about coding it in QB64, or moving on to better RPG Maker software, but I just haven’t the time. If I had the C coding skills I might even have considered an iPhone app, or an Xbox Indies games, or something. But I don’t. So enjoy this save file for what it is – an unfinished dream. 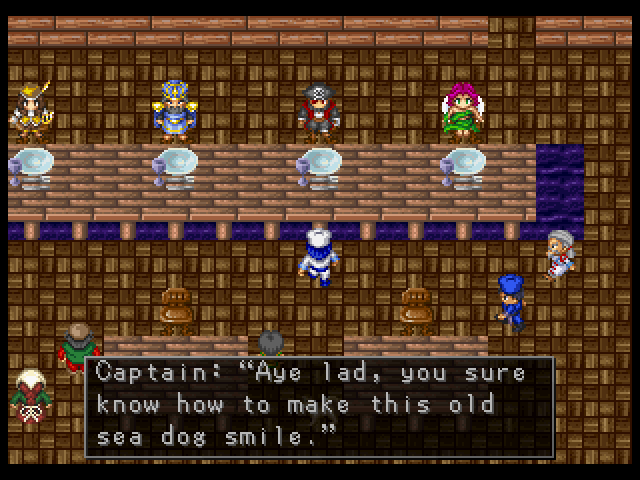 On another note, how bloody awesome would it be if ASCII or Monkey Paw Games, or someone, anyone, re-released RPG Maker on PSN, and we could all start making games and emailing each other our creations? It’s been far too many years since we’ve had the opportunity to use an RPG Maker game in English. The save file is HERE. I am warning you now that I was a teenager when I made this, and I take no responsibility for offending anyone because the content is on a level akin to a screaming Xbox Live adolescent. If jokes about hobos, diarrhoea, internet slang, and testicles offend you, stay far away. The ZIP files contains only an emu save file – I edited the save ever so slightly to remove a slightly gross soup joke, but afterwards was unable to export it to the format used by the PS3. If you know how to convert emu files to PSV, post in the comments! "It’s been far too many years since we’ve had the opportunity to use an RPG Maker game in English." 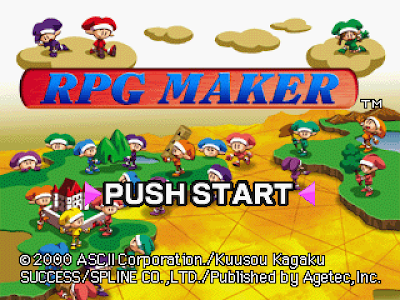 Dude, Google "RPG Maker XP" and/or "RPG Maker VX". They seem to be unpleasantly allergic to Windows 7 (possibly a 32/64 bit issue or something), but they've had Windows RPG Makers for quite some time now. 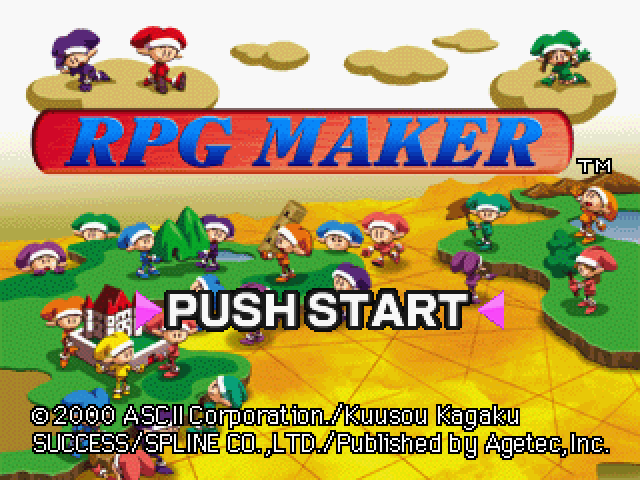 In fact, some people sell RPG Maker-based games in English now. Also the illegal fan-translated RM95, RM2k, and RM2k3 (and the both legitimate and pirated Japanese versions) have been around for even longer. There are jillions of games made with both legit and fan-translated RPG Maker, some of which are actually pretty good. 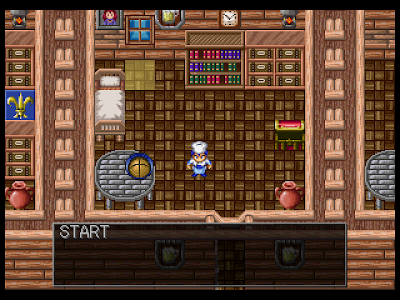 I wish I had the time (and patience) to make something in RPG maker. 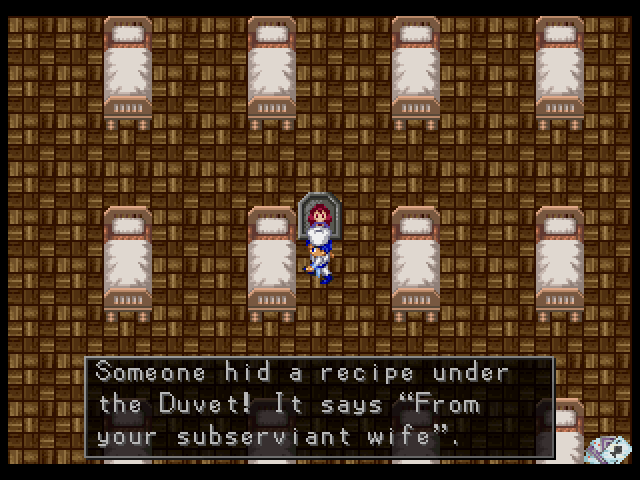 Apologies, Mad Tinkerer, I should have said "console RPG Maker". I know of the Windows ones and know they're still being used (the Barkley Gaiden ROPG started on it), but doing that kind of stuff on my PC is just kind of a drag. 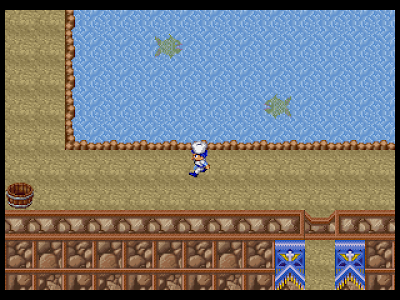 I actually dabbled a lot in the hacked RM95 and RM2k versions, plus the earlier SNES RM titles, but I never actually completed any projects until the PS1 version - which is kinda my favourite. Sitting in front of a TV is more conducive to my creativity. My brother did quite a few on the Windows titles - I don't think he uploaded them, but I vaguely recall he spent ages working on them.